I’m blessed to be in a Bible study this fall and we’re covering 1st and 2nd Thessalonians. It is absolutely wonderful and even though I’m drop-dead exhausted at the end of every day, I make time to work on my study even if that means I do all of it on the weekends. It is so worth it to me! That said, I found a new favorite verse in 1 Thessalonians and I’ve decided it will be my verse for the school year. I’m posting it on the walls so I can see it as a continual reminder of my goal and aim this year. 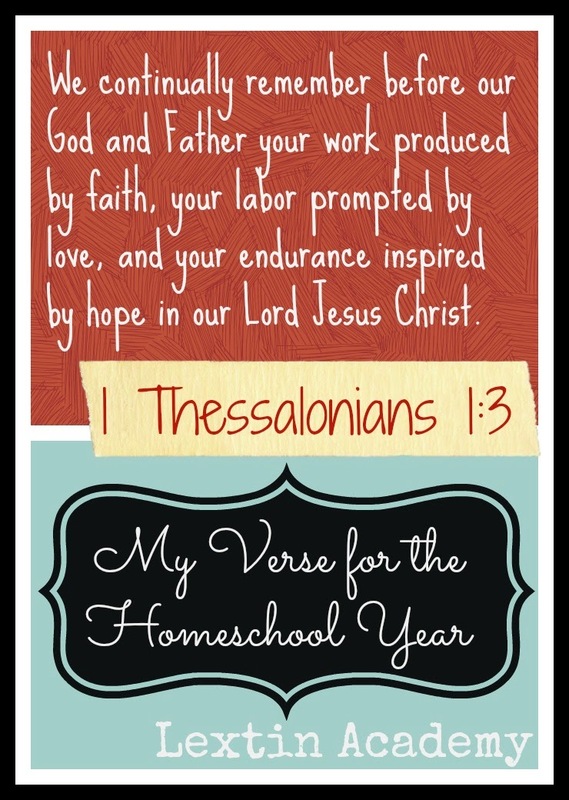 This homeschool thing is a work of faith. It’s terrifying to think that I am responsible for the lives and education of my 5 little people. I’m stepping out in faith and choosing to homeschool because we believe that it is our current calling upon our family. But it’s work, oh is it a lot of work! Home educating your children is a labor of love. Many days I don’t love it but I love my children and that is what prompts me to continue. I need this reminder that the motivating factor is love. I want to show that love to my children and live out that love as a continual reminder of God’s love for them. Homeschooling is an act of endurance. How many times have I wanted to give up? Many! And we’re only up to 3rd grade right now. I have to persevere because I have hope that God will work through me. I have hope that my children will grow into the people that God has called them to be. I have hope that God is guiding our future. This verse reminds me of the 3 things that will be remembered about me-my faith in Christ, my love toward others, and an endurance of hope.